I love to read. Pre-kids I was rarely found without a book in my hand. Post kids, it’s much harder, but that makes reading a guilty pleasure. The trouble is that I am a little bit boring in my choice. I like a few dead bodies, and a good detective. 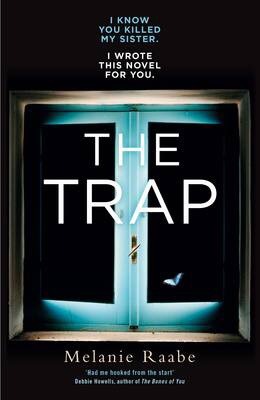 When I read the blurb on The Trap, it sounded like it would be right up my street. The murder took place before the book commences. Anna, Linda’s sister, is murdered, and Linda believes she saw it happen. Linda is almost as famous for being a recluse, as she is for being an author. I don’t suppose I ever gave any thought to what agoraphobia must be like before I read this book. Yet when I read the vivid behavioural descriptions, it seems to me that I know exactly what it is like. We get to know Linda very well quite early on. That only serves to make the following chapters even more spine chillingly nail biting! So what would you do in her shoes if you suddenly saw a high profile public figure and immediately realised that this was whom you had seen murder your sister? Tell the police? Say nothing? Linda does neither. She writes a book about a very similar murder, then grants the killer one single media interview. Alone. At home. I am not going to spoil the book for you. What I will say is that the mastery of the language, and believability of the characters means that even a seasoned ‘muder detective’ like me had no idea what the outcome was going to be. It may or may not be the outcome you expect. Whatever your guess, you will enjoy reading this engaging thriller from start to finish. Ooh ah those summer nights…un-yummy mummy style! Mummy fell down and bumped her head!